IF YOU'RE LOOKING FOR A DELICIOUS ON THE GO TREAT THAT'S ACTUALLY GOOD FOR YOU, LOOK NO FURTHER! I'm A Nut's Roasted Salted Cashews are a delicious savory treat that will satisfy your taste buds and is rich in nutrients to give you the energy to get you through your busy day! Our cashews are wholesome and delicious! Grab them to go as a pick me up snack in between classes or meetings. Use them in your cooking as a crunchy, savory addition to your meals to spice things up! THE NUTRITIOUS BENEFITS IN ONE SERVING OF OUR PRODUCTS ARE PRACTICALLY ENDLESS! These tiny treats pack a BIG nutritional punch, with a substantial dose of protein, antioxidants, vitamins E, K, B6 and other vitamins and minerals. They're 100% kosher and gluten free, free from any dairy products. They're the perfect food to support a fit lifestyle! They make the perfect portable snack for you to grab in a hurry for a quick snack on the way to work, class or just about anywhere! They also make great additions to gift baskets, stocking stuffers and snack bags for parties. They make wonderfully wholesome appetizers at parties and gatherings. Their uses are truly endless! Pick up a bag today and GO NUTS for I'm A Nut's Roasted Unsalted Cashews! WHOLESOME & DELICIOUS: Our roasted salted cashews are a delicious treat that will satisfy your tastebuds and are extremely filling as well! Enjoy alone as a snack or use it in your cooking! KOSHER FOOD: Our roasted salted cashews are 100% kosher, making them a great food option during Passover, for kosher cooking and can also be enjoyed by everyone at any time of year. GREAT ON THE GO: These roasted salted cashews are both healthy and satiating, making them the perfect filler for in between meals. Bring them with you to work or class as a nutritious on the go snack! RICH IN NUTRIENTS: Cashews have long been known to be high in protein, antioxidants, vitamins E, K, B6 and other vitamins and minerals. Add our roasted salted cashews to your daily diet for a wholesome treat. LARGE QUANTITY: Twenty five pounds of supreme 320 grade fancy cashews, great as a cooking ingredient as well as for eating. Its high quality form will look fantastic on display as well. 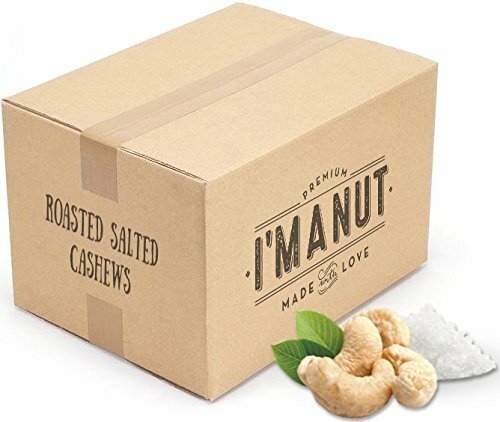 If you have any questions about this product by I'm A Nut, contact us by completing and submitting the form below. If you are looking for a specif part number, please include it with your message.